It is unlikely we'll be giving out extra plants there as we now have 3.6 acres to fill! This website will remain for historic/reference. 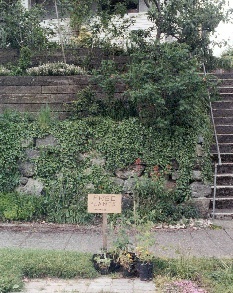 From 1999-2003, in front of our home in Seattle's Green Lake neighborhood (52nd St. near Stone Way), you could occasionally find a handful of plants in pots next to a "FREE PLANTS" sign. These were "dividings" or "volunteers", and were free for the taking. I love to get email, so don't hesitate if you wish to ask questions (or to send thanks) (send email to mikel)! Note that I do add more photos to this page as I get around to digging them up from my collection and scanning them; if you don't find photos of the plants you picked up, do check back occasionally, they may appear eventually. My wife and I are not plant professionals in any way, merely avid amateur gardeners. There are no guarantees these plants will survive, or even that they are actually what we've stated they are in these pages. "Buyer beware" and "you get's what you's pays for". Also, any advice given in these pages merely reflects our observations in our backyard -- it may not jibe with the optimal conditions for the plant. That said, I hope you find them as rewarding as we have!